Two runners in feature race's on the Hillside course at Sandown today with Vengeur Masque and Radipole running. 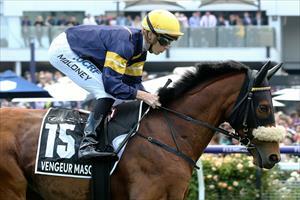 Vengeur Masque (pictured) is the first to go in race two, the Sandown Cup over 3200m with Patrick Moloney to ride. The seven-year-old import has come through his unplaced Melbourne Cup run in good order. “The distance and the 60kg will not make it easy,” Mike Moroney said. “The Melbourne Cup run was, I thought, inconclusive. “Both times he has run over two miles it has been on wet ground and he struggles on it. The main thing for Saturday is that he’s on a firm track. “It doesn’t look the strongest race and he could end up getting a soft time in front but the main thing is to establish if he can get a strong 3200m. Radipole runs in race four, the Eclipse Stakes (Gr 3) over 1800m with James Winks to ride. At his last start Radipole finished a good fifth in the Cup Day Plate (Listed) over 1800m at Flemington when the track was slippery and Moroney is pleased with the way the six-year-old has come through the race. “He’s come through that last run in good order and this looks a nice race for him,” Moroney said. “From barrier two he should be able to slot in just behind the speed and it looks a similar sort of race to the one he ran in at Flemington.